There are 45 dragonfly and damselfly species in the UK, of which 23 breed in East Yorkshire. I was amazed to find that 15 of these have established themselves in the county only after WWII. The recent colonists include now common and widespread species like the Common Darter, the Blue-tailed Damselfly and the Emperor Dragonfly. 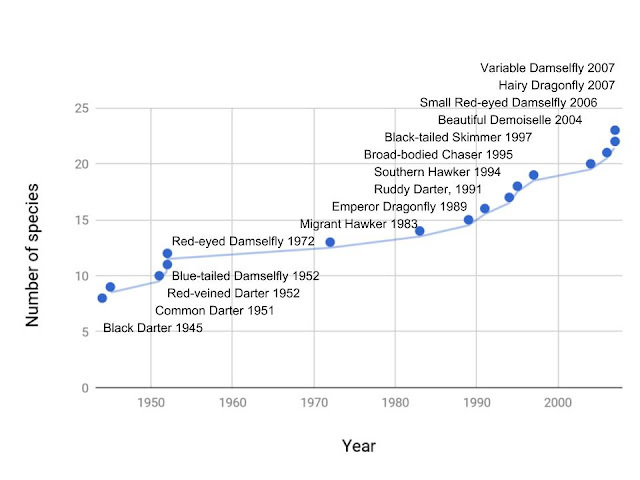 Cumulative number of East Yorkshire dragonfly and damselfly species and the first record of each colonist species (data compiled from Paul Ashton's Dragonflies of South East Yorkshire, 2013). 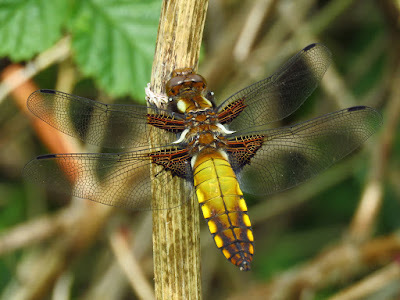 Recent studies taking advantage of the wealth of records held by the British Dragonfly Society indicate that warming climate largely explains northward range shifts, range expansions and earlier emergence observed in most British dragonflies and damselflies. In contrast, the few northerly species have also shifted their range north, and their ranges remained stable or slightly contracted in size. Some extreme examples of range expansions are the Common Darter, with a northern distribution range that moved north 346 km in 40 years, the Keeled Skimmer shifted 190 km. 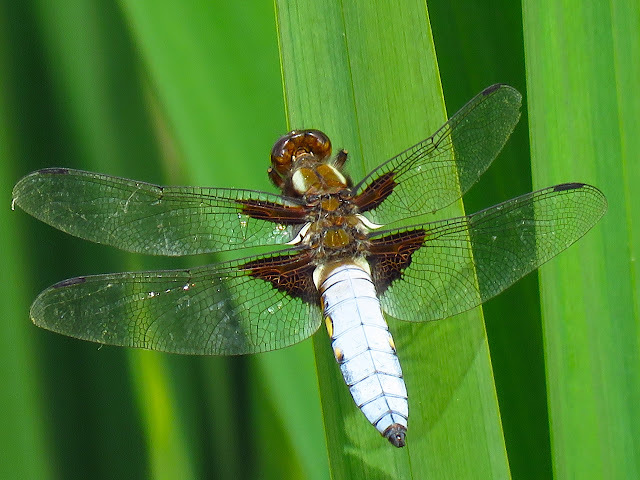 One of the recent East Yorkshire colonists is the Broad-bodied Chaser, with a first record in 1995. It is now quite widespread but still establishing and expanding its range. Today I visited a pond in a site in the outskirts of the city, which has maintained water until now this year probably due to the higher than usual rainfall this winter and spring. I took advantage of a short sunny spell this afternoon in an altogether warm muggy day to try and see the Broad-bodied Chaser I had seen there before in mid May. 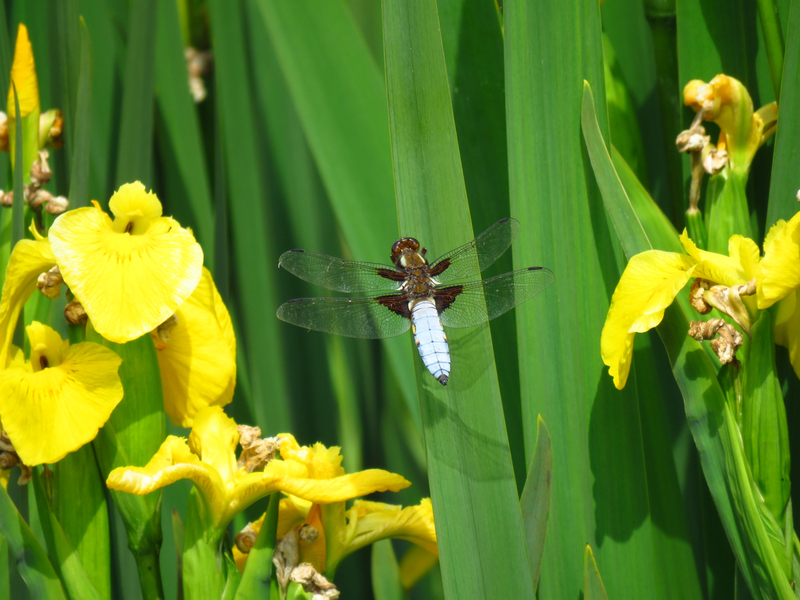 This is a large, striking dragonfly, which readily colonises new ponds, including garden ponds. They have a flattened abdomen and dark spots on the base of the wings. Males have a powdery blue abdomen and yellow spots on the sides (top shot), the females a yellow/brown abdomen (below). Males maintain territories in ponds, where females may only approach the pond to mate and oviposit. 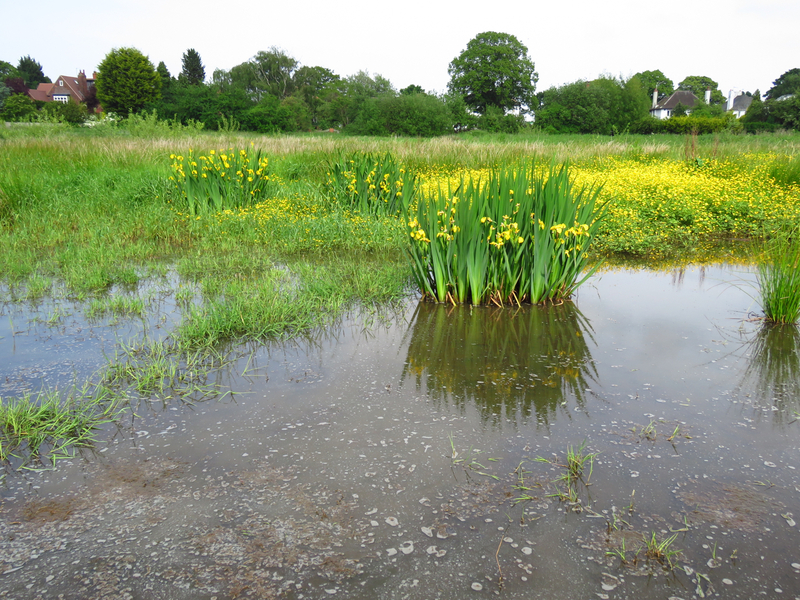 As an adaptation to the shallow, small ponds where they develop, their larvae are able to move over damp, but otherwise dry terrain if the pools where they are developing are dry. Not long after I arrived, a male passed flying by hunting and patrolling over the pond, about half a meter above the water. I briefly saw a female too, which didn't settle. This species flies in a zigzagging way which makes it hard to follow, but it is a large animal, and has a habit of perching in favourite spots regularly, which more than compensates for it. The male settled on the most inaccessible part of the pond a few times, but finally it alighted on a large clump of Yellow Flag irises near me, where I could watch and photograph it easily. Ashton, P. (2013) Dragonflies of South-east Yorkshire. 105 pp. Hassall, C., Thompson, D. J., French, G. C. & Harvey, I. F. Historical changes in the phenology of British Odonata are related to climate. Glob. Chang. Biol. 13, 933–941 (2007). Hickling, R., Roy, D. B., Hill, J. K. & Thomas, C. D. A northward shift of range margins in British Odonata. Glob. Chang. Biol. 11, 502–506 (2005). Piersanti, S., Rebora, M., Salerno, G. & Gaino, E. Behaviour of the larval dragonfly Libellula depressa (Odonata Libellulidae) in drying pools. Ethol. Ecol. Evol. 19, 127–136 (2007).